The 4-leaf barndoor for the S30 allows for control of light spill and narrowing of the beam angle. The 4-leaf barndoor for the S120 allows for control of light spill and narrowing of the beam angle. Arri barndoors are heat resistant and rotatable. Arri 8-Leaf Barndoor for the T1 Studio Fresnel. Arri 8-Leaf Barndoor for the ST1 Studio Fresnel. This is the Arri 8-Leaf Barndoor for the ST2 Studio Fresnel. Arri barndoors are heat resistant. For the Arri 6K and 12K HMI lights. either four or eight leaves that can be adjusted. For the Arri 650W Fresnel. Barndoors narrow the beam spread of a light fixture. 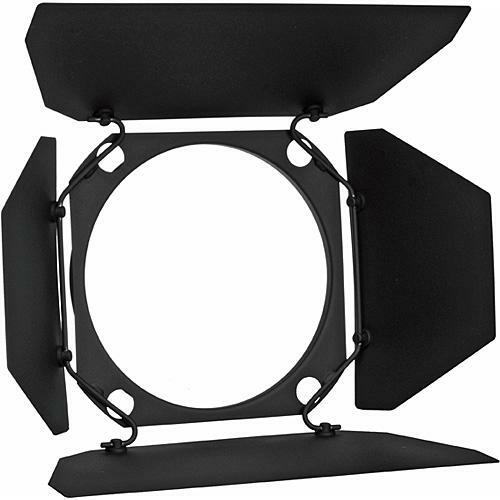 2 leaf barndoor set for the Arri Studio Cool 2 fluorescent light fixture. 4 leaf barndoor set for the Arri Studio Cool 4 fluorescent fixture.